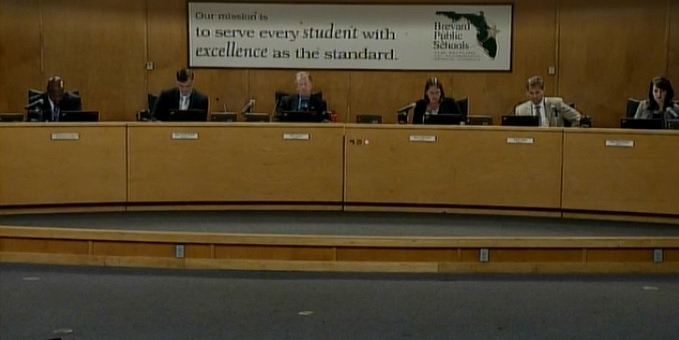 BREVARD COUNTY, Florida - The Brevard County School Board unanimously approved a voluntary plan to further desegregate schools on Florida's Space Coast. According to the plan filed with the School Board, the plan proposes to foster student integration and diversity while reversing a trend of declining enrollment that leads to minority isolation. Specifically, "Brevard Public Schools will continue to address socioeconomic diversity by establishing new magnet school programs at South Lake Elementary in the northern part of Brevard County, Rockledge High School in the central part of the county and Palm Bay Elementary in the southern part of the county." In a 2007 report by the Florida State Advisory Committee to the United States Commission on Civil Rights, 16 out of 67 public school districts remained under federal court jurisdiction to desegregate schools. Another 18 Florida school districts have "unitary status" which means that de facto segregation exists, but is not the result of state-sponsored discrimination. Brevard County is deemed a "unitary status" school district. October 13, 1961 – The first federal discrimination lawsuit was filed against Brevard County. June 25, 1964 – A federal court finds that Board of Public Institution of Brevard County has not adopted a definite plan of desegregation as required by decision of the Supreme Court-Board was directed by the court to file a plan on or before 7/23/64. October 1, 1968 – A desegregation plan was submitted. May 11, 1973 – A federal court approved the school board plan as proposed. September 8, 1976 – The federal case was dismissed without prejudice. Between 1976 and 1978 the Brevard County School District was designated as having unitary status requiring the district to maintain a de facto segregated school system under a voluntary desegregation plan. January 16, 1990 – A Brevard County School Board desegregation plan was approved to keep Clearlake, Kennedy, and McNair as central area mainland 6-8 grade middle schools, designing McNair as a magnet school and creating a gifted student center for the central area middle schools at McNair. November 11, 1992 – A Brevard County School Board desegregation plan was modified to designate Gardendale Elementary as a magnet school. July 19, 1994 – A Brevard County School Board desegregation plan was modified to designate Riverview and Golfview as magnet schools. April 11, 1995 - A Brevard County School Board desegregation plan was modified to create new magnet programs at Endeavour, Golfview, Riverview, and McNair. April 10, 2007 - A Brevard County School Board desegregation plan was modified to designate Riverview, University Park, and Riviera as magnet schools. February 26, 2013 – The Brevard County School Board approved the magnet resolution to establish Stone Middle and Palm Bay High as new magnet schools, to revise the magnet at at McNair Middle Magnet and Golfview Elementary Magnet making all four schools Science, Technology, Engineering, Arts, and Mathematics (STEAM) themed magnet schools. March 14, 2017 – The Brevard County School Board approved the magnet resolution to adopt a revised voluntary desegregation plan and designate South Lake Elementary, Palm Bay Elementary and Rockledge High School as the newest MSAP schools. The addition of two of these schools will finalize a K- continuum for Science, Technology, Engineering, Arts and Math (STEAM) in the central and southern portions of Brevard County.